Comprehensive review of ProactivMD Acne Treatment Retinol. See how this retinol cream compares against other wrinkle creams! ProactivMD Acne Treatment Retinol works very well for anyone looking to help with acne or texture problems, but not as well for anyone looking to plump fine lines and wrinkles. The texture of this retinol product is a gel, and it feels pretty nice on the skin. It comes in a squeezy tube which makes the product easy to apply, and a little bit of the product goes a long way. There isn’t really any smell to this product and after it’s applied, it takes about 15 seconds to dry. Once it’s dry, it feels totally untraceable on the skin. After using this product for a short period of time, I noticed that my skin became a bit dry and flaky. Although, that can sometimes be expected with retinol products. After using this product for a longer period of time, my breakouts started to reduce a lot and the texture and pigmentation of my skin was looking and feeling very even. Unfortunately, it didn’t do much for my fine lines and wrinkles though. I wish it would have targeted both my wrinkles and my breakouts. Overall, ProactivMD Acne Treatment Retinol works very well on breakouts and texture, but not so well for anti-aging purposes. The texture of the ProactivMD Acne Treatment Retinol feels like a standard gel. It spreads out very easily on the face and a little bit goes a long way. ProactivMD Acne Treatment Retinol is really easy to apply. I like the squeezy tube because it makes it very easy to control the amount of product that comes out. Sometimes the tube can be difficult to use when you get down to the bottom, but overall I generally like the applicator. Since this is a gel product, it’s really easy to apply and you only need a little bit of product to cover the face and neck. ProactivMD Acne Treatment Retinol dries really quickly in about 15 minutes, and after it’s dry, it’s totally undetectable on the skin. These is basically no smell to ProactivMD Acne Treatment Retinol at all. If anything, it just smells similar to petroleum jelly. After using ProactivMD Acne Treatment Retinol, my skin was kind of dry and flaky, but that can be expected sometimes when using a retinol product. Over a longer period of time using ProactivMD Acne Treatment Retinol, I noticed that it helped reduce breakouts a lot and it helped with hyperpigmentation and uneven skin texture. It didn’t really help with fine lines and wrinkles much but since it’s advertised more as an acne cream, it seemed to do what it was meant to do. I do wish this product did both though. I really enjoy how it helped my skin, but I wish it would have helped plump my fine lines and wrinkles. 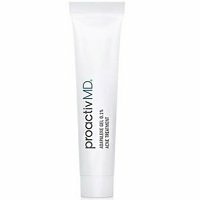 ProactivMD Acne Treatment Retinol only has 8 ingredients, and within those ingredients, I didn’t really see any that I am used to seeing in a retinol product. Adapalene 0.1% is the main ingredient in this product and is the form of retinol used. This type of retinol is supposed to specifically target and help acne, and heal it quickly. Adapalene penetrates the skin deep down into the pores and it helps not only heal current breakouts, but helps to stop new breakouts from forming. It can also help restore the skin’s texture and tone. All other ingredients in this product aren’t geared toward helping the skin. After learning about this product, I can see why this gel helped with my breakout and texture of my skin. The cost of ProactivMD Acne Treatment Retinol is $17.95 for 1.6 oz of product which comes to 11.21 per oz. This is about an average price for a retinol gel. Thankfully there is a 60 day, 100% money back guarantee for ProactivMD Acne Treatment Retinol. To buy ProactivMD Acne Treatment Retinol, click here. Ingredients Adapalene 0.1% is a retinol that targets acne and breakouts.